At last, the blog is launched. Welcome, dear readers! I hope you’ll read along with me through the Christmas Revels in December. If you want to catch up, you can read my introduction. (Short version: I’m a veteran chorus member.) I’ve already blogged about trying on my costume, a truly amazing pumpkin, and singing a song with the word “nimrod” in it. Trio Sefardi (Howard Bass, Susan Gaeta and Tina Chancey). Photo by Jeff Malet, MaletPhoto. Tonight was our first time practicing with all three of the members of Trio Sefardi – Susan Gaeta, Howard Bass, and Tina Chancey. 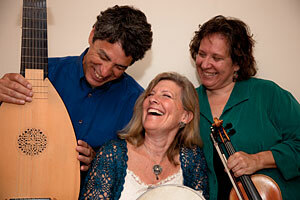 They’re a local group that plays Sephardic music. When Tina instructed us to find our inner Tevye, we were singing “Quando El Rey Nimrod,” one of the Sephardic songs in this year’s Christmas Revels. In the song, Nimrod, a king in the Bible, goes out to the fields, looks at the sky, and foretells the birth of Abraham. Anyway, the song we were working on is about King Nimrod. It’s lovely, with flowing, melodic choruses and a bouncy refrain. Tina, Howard, and Susan sat facing the chorus, playing instruments and, in Susan’s case, singing. Tina leapt out of her chair to demonstrate how the song’s refrain should move and dance. 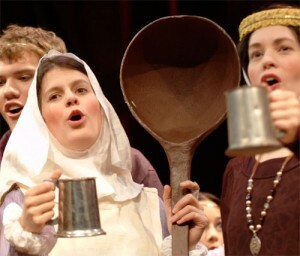 And we all got even more excited about the music we’re singing for this year’s Christmas Revels.